How many of you can remember the “kids” table? Company comes over. Relatives visit and pinch your cheeks and tell you how much you’ve grown. You got banished to the “kids” table. Your biggest goal in life was to graduate to the “grownup” table because it looked like the adults had so much more fun! Can anyone relate? Or are you like me and would give anything to sit at the “kids” table now even if just for a few minutes? 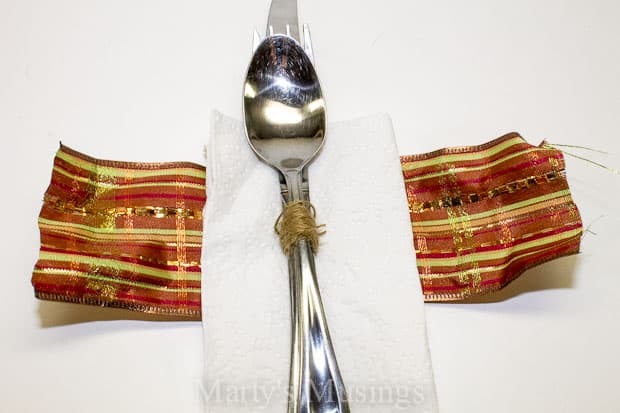 I’m here to show you how to make your Thanksgiving table so unique the kids will actually want to have their own table. First of all, I grabbed some small, old mismatched glass jars and located some Behr paint that I had handy. One of my favorite ways to use the leftover paint at the end of a room project is to incorporate it into my home decor. I chose Behr Premium Plus Ultra Yellow Begonia from our kitchen makeover and Behr Premium Plus Ultra Toasty (a Sherwin Williams color) from our den makeover. 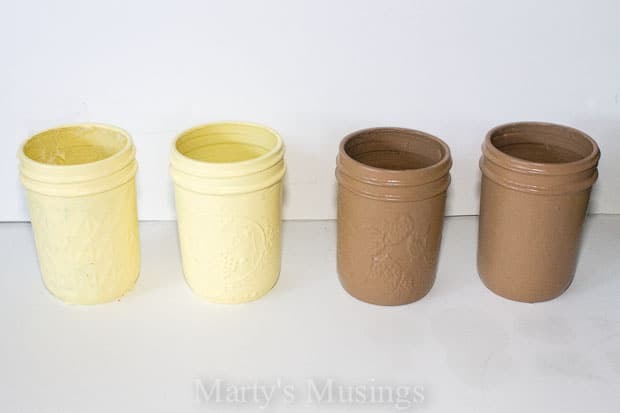 The jars below have four coats of paint on them, and since I knew I wanted to distress them I didn’t worry about them being perfect. 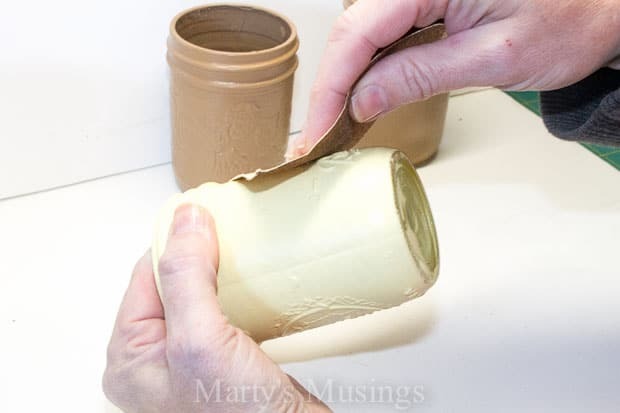 I distressed the mason jars with sandpaper, especially over the raised glass areas. I let dry at least an hour or two in between coats. 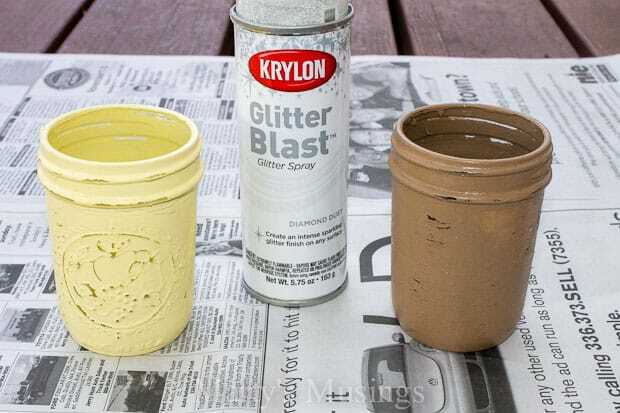 I then took the jars outside and added a coat of Diamond Dust Glitter Blast paint from Krylon. 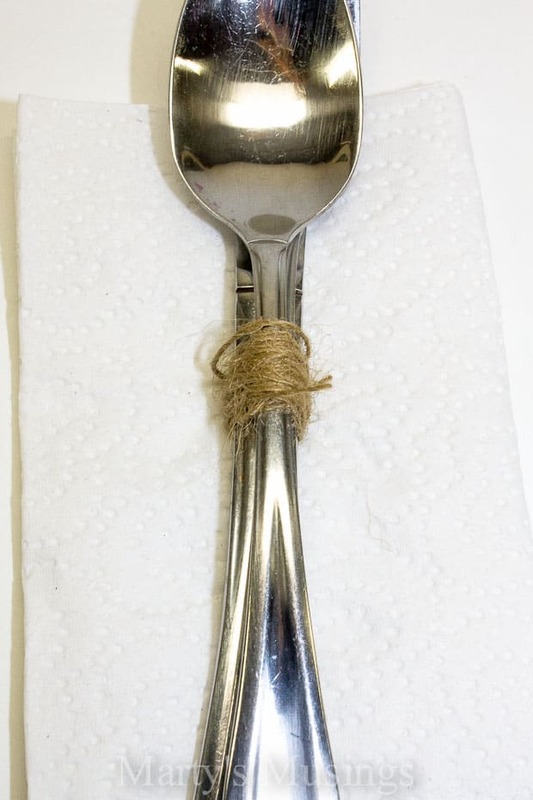 While the paint was drying I grabbed some silverware and bound it together with burlap strands and folded a napkin in half. 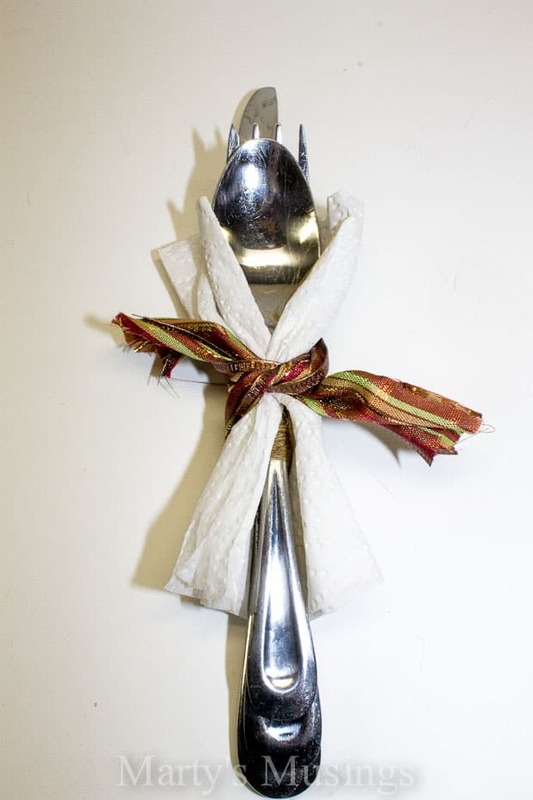 Since I’m a ribbon hoarder I just went to my stash for some fall glitter ribbon and set the silverware and napkin on top. 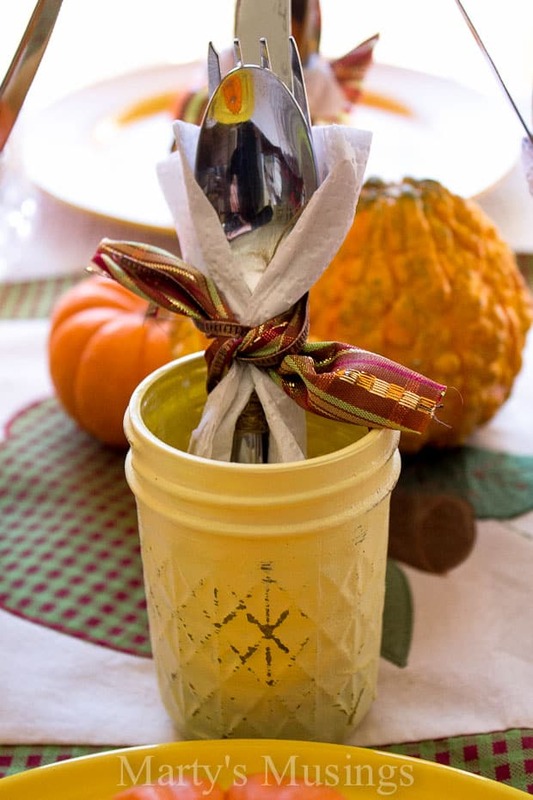 Here is the kids’ silverware in a cute little bundle just for the young ones! 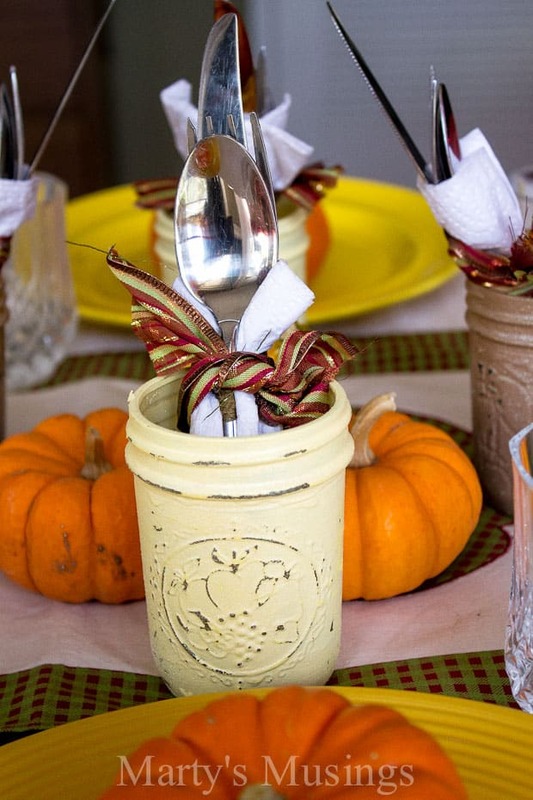 The mason jars look as cute as a button with the silverware inside. A closeup shot of the jars shows you how fun the distressed look turned out. The brown jars pick up more of the glitter effect that I love. I do love me some glitter and bling! The plates were from the dollar store , the table runner was a $1 yard sale find and I picked up the pumpkins from the grocery store. 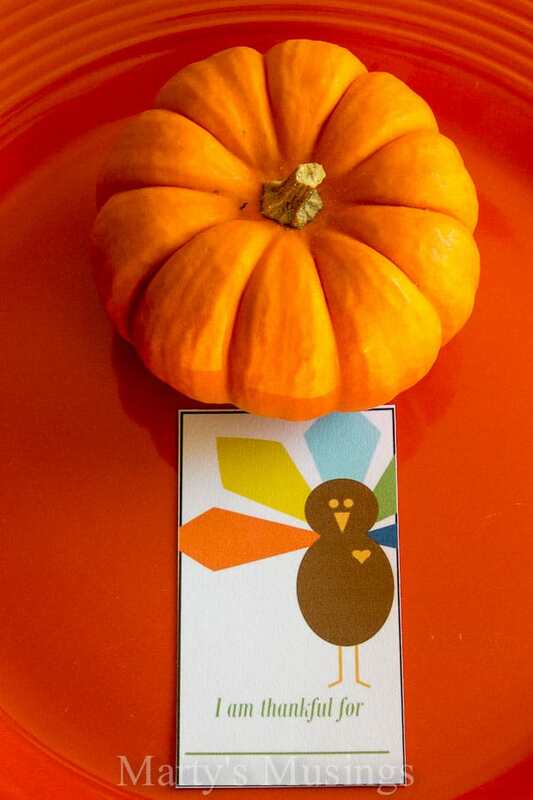 I used cardstock for this free printable from Uncommon Designs and you can either write your child’s name or ask him what he is most thankful for. And there you have it! A table even the grownups kids will love! 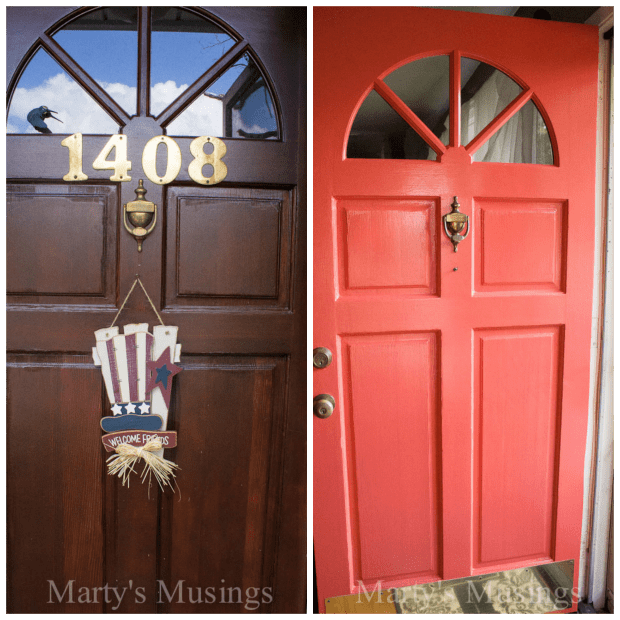 Did you see my front door transformation with Behr paint? It’s amazing! 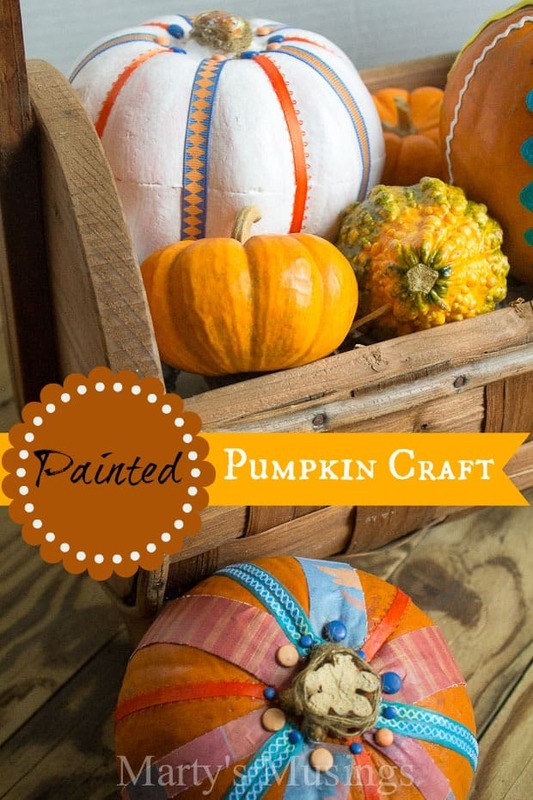 Or how about my painted pumpkin craft last month? 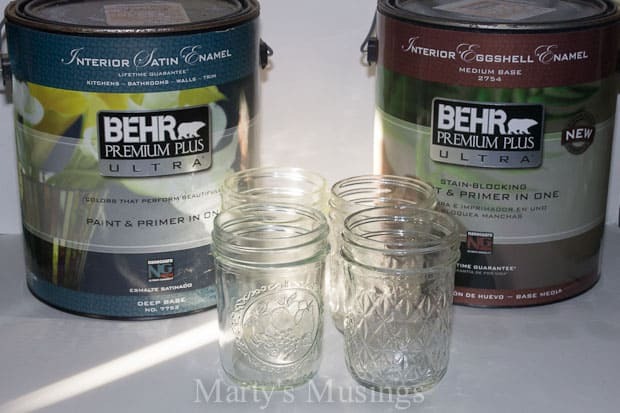 Want to see more of the Behr products that we use and love? Check out the Colorfully, Behr blog which is about all things color through the eyes of Erika Woelfel, Director of Color at BEHR Paints. You can also create your own palette using color matching tools on BEHR.com. Disclosure: I was provided with product by Behr but the opinions are all my own! 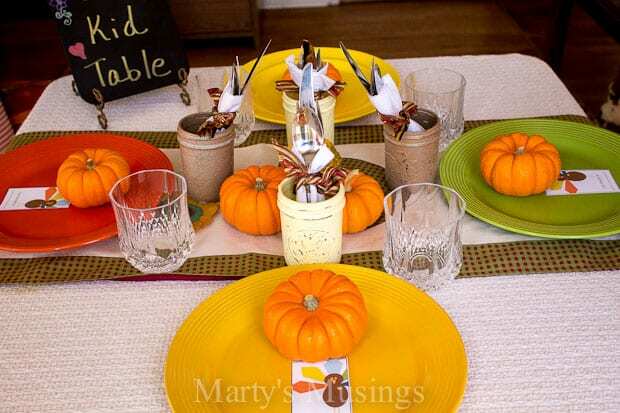 I love the table setting idea for kids. It makes them feel special! 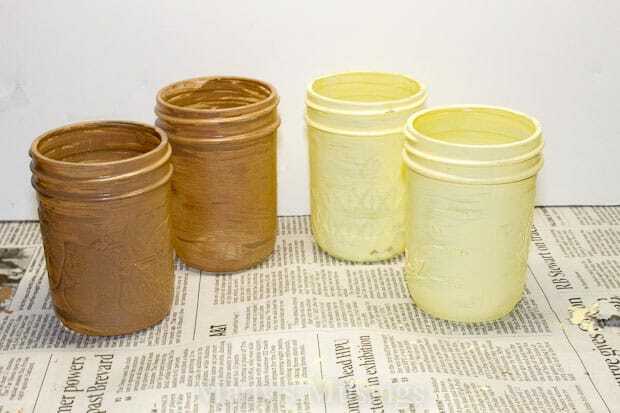 I have a few mason jar and some paint! Thanks for the inspiration! Hi, Andrea. Are you as excited about Thanksgiving as I am? 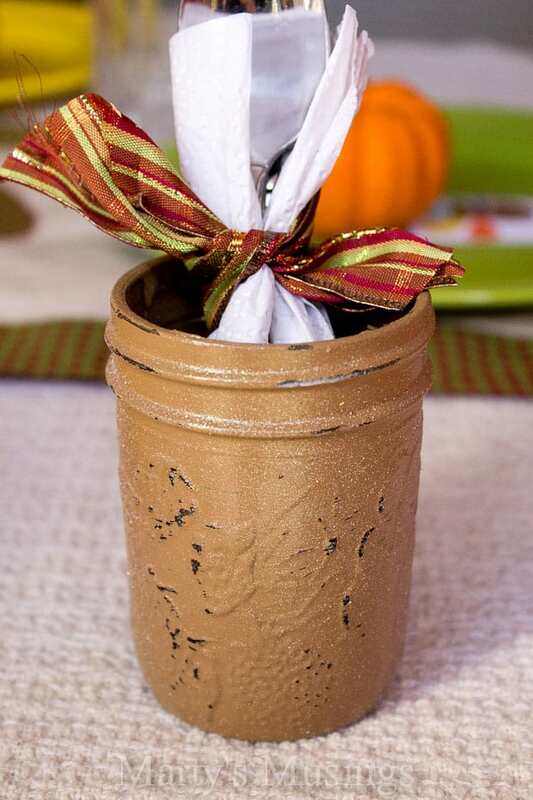 I would love to know how your mason jars turn out! Thanks for visiting Marty’s Musings. Really sweet! thanks for sharing on craft schooling Sunday! Please grab a button if you can, and do try to help me promote my blog/party, my little party has become a huge event over night and while I’m not complaining it does mean tons more work to keep it a quality event! 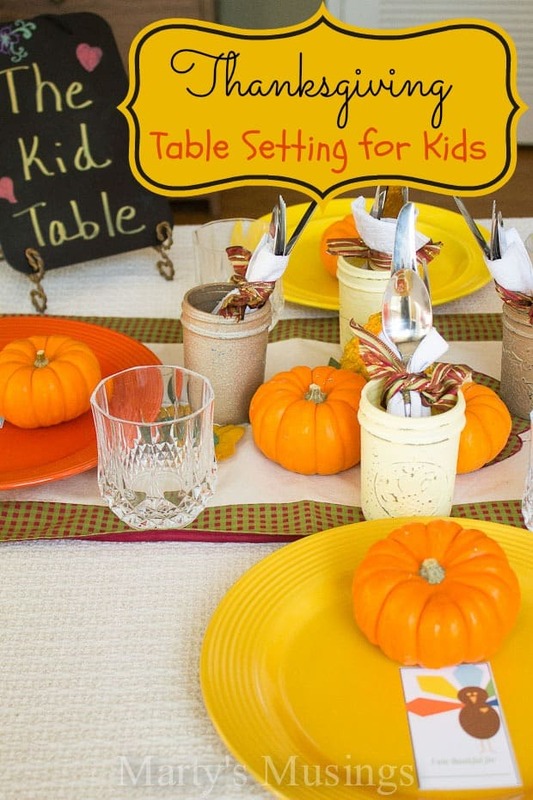 Such a cute idea for the kids table. Thanks for linking up at the Best of the Blogosphere Linky party! I love this!!! Pinning and planning to do this for sure!! 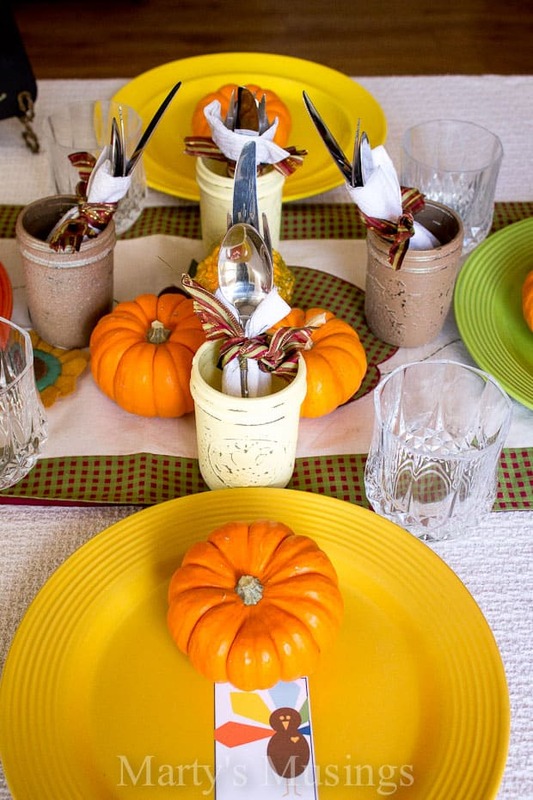 What a cute idea…I love your tablescape (and the kids will too)! Thanks so much for sharing at Share The Wealth Sunday! Very nice – classy but kid-friendly. 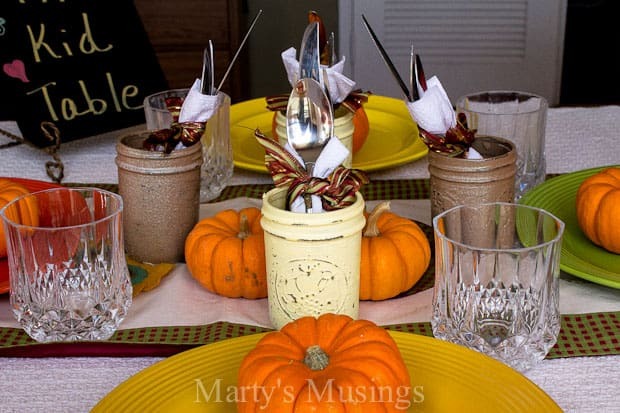 The mason jars work perfectly (glitter spray – how fun!) and the printable Thankful tag is a nice touch. Well, I think we sat at the kids table for many years past adulthood! This is such a fun idea and thanks for posting on Throwback Thursdays!